And we’ve had a great term at Golden Buds- the new wheel barrows went down a storm, the sun shone and we even had the fire wok out for toasting snacks. The morning group is full for next term but we’ve gotspace in the afternoon group 1:30-3, so get in touch (and thanks to Lindsey, Nikki, Pauline, Caroline, Christopher, Joe and co who sing, dig, dip, and keep everyone safe). 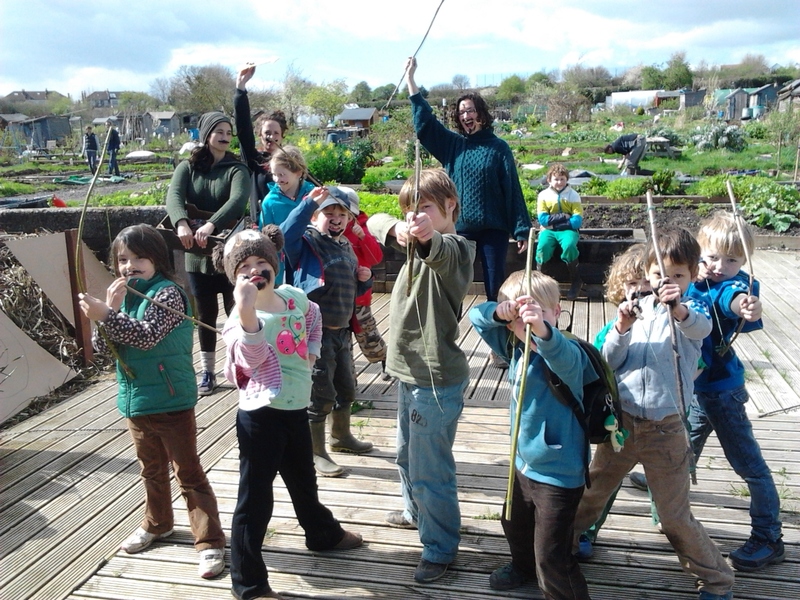 We’re all ready for the Golden Adventure days starting next week – and if you’d like to volunteer for a day or games, pizza cooking and general silliness in the garden Tuesday 31st or Tuesday 7th then get in touch. It’s a castaway theme, we’ve got loads of kids coming along and we’d love some more hands on deck. And in the midst of all this spring has sprung and the Wednesday volunteers have had their noses to the grindstones planting, planting, planting soooooo many seeds and the polytunnels are filling up nicely (thanks Sue!). It’s a great time to come and get involved. Especially if you like planting seeds. This entry was posted in News from the Garden on March 27, 2015 by GHCG. Ahoy there! Calling all 5-12 year olds looking for a spring time adventure! Hop aboard the Good Ship Golden Hill with Captain Clare and the Able Seabadger, but uh-oh … hope we don’t get shipwrecked and washed up on Garden Island. We’d have to build shelters, forage for pizza, hunt for treasure and try not to get eaten by sharks! Eeeek!! Places are already filling up and are limited to just 16. I’ve attached the forms below but give me a quick ring/text/email to check our availability. Tuesday 31st March and Tuesday 7th April 10am-4pm £25 including pizza and snacks. This entry was posted in News from the Garden on March 6, 2015 by GHCG.